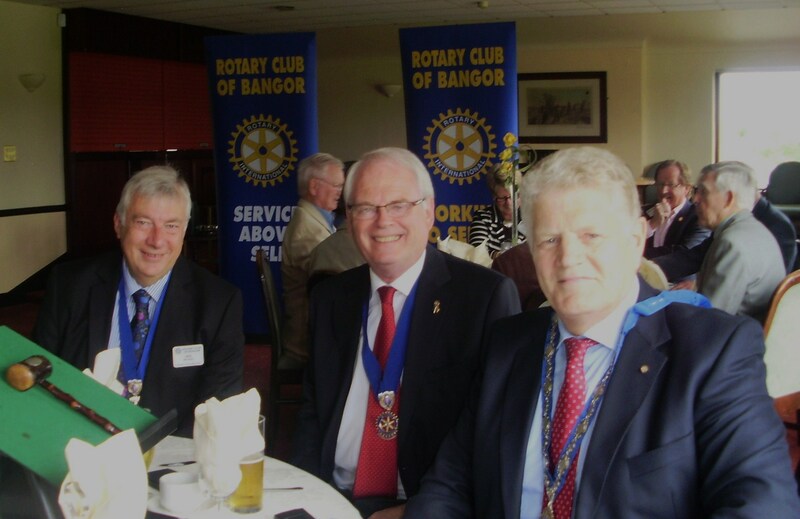 At their weekly meeting, on 3rd July 2013, the Rotary Club of Bangor appointed a new President for the 2013-14 year. Robin Mussen took over from outgoing President Bill Aiken. President Bill said how much he had enjoyed his year which yielded charity funding in excess of £11,000, besides featuring a number of very enjoyable social events for Rotarians and their friends and families. He went on to thank his Council members and other individuals who had made significant contributions to a very successful year. Besides the appointment of a new President, the meeting saw the appointment of a new President Elect, Ian Wilson, and a new Vice President, Paul Hatty. The incoming Council comprises Bill Aiken, Roy Rosbotham, Denis Neill and Gavin Walker. Richard Eakin will continue as Hon. Treasurer and Gavin Walker will continue as Hon. Secretary until later in the year when Howard Davidson will take over the role.